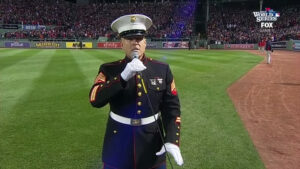 Marine Sergeant Sings “God Bless America” During Seventh-Inning Stretch, Leaves the Crowd in Complete Awe! When this man stepped out to perform “God Bless America” in front of the crowd, the audience could not believe that this was happening for real. Marine Corps Sgt. Dan Clark became the hero of the day who captivated everyone with the rendition of the second most popular song across the country, the first being the National Anthem. The viewers, who were present at the games, gradually started to lose interest in the entertainment and were about to voice their displeasure, when the sergeant stood up to save the day and prove that they have arrived at the right place. The patriotic delivery of the song will touch your heart at once. This is the moment that needs to be mentioned again and again. You can tell that the crowd is excited to watch the Marine performing, and the viewers claim that the veteran did his best to stand out among the others. What is even more amazing, he did not try to outshine the players and remained humble throughout the whole show. The melody itself can trace its history back to WWII, and you have to click on the video to appreciate the power of sound that is displayed below. There are days when you have to give it up for the performers that agree to an impromptu concert. Though it was definitely a challenge for the Marine, who felt a lot of responsibility that day, he definitely lived up to his reputation and proved that there is no such notion as a retired serviceman. You will be delighted to meet him below, and we hope that you are going to enjoy the performance as soon as you start watching. The arrangement of the melody is also one of a kind, and the fans claim that there are no pop stars that can deliver the song better than Sgt. Dan Clark did it that day. This is definitely a moment to behold, and if you have time to dedicate it to good music, we would like you to check out the cover below. The crowd grew restive as the games continued, but the Marine managed to bring joy to the competition with his patriotic approach. This is a cover that is indeed fantastic!